Last weekend was quite eventful for our little family! 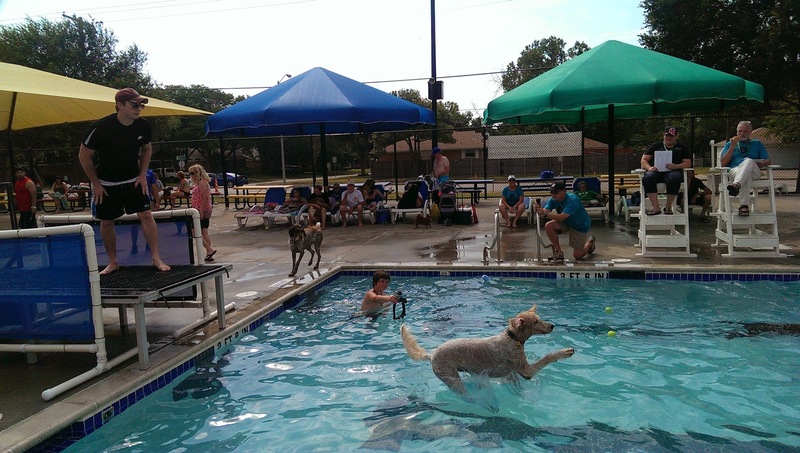 Once a year, sadly only once per year, the Dallas area pools close for the summer season, and on the magical day following, the pools are opened up for all of our canine friends -- Doggie Splash Days! Way back in July, I started researching the best splash days to attend, and I decided on Mesquite and Rowlett, the same two that we attended last year because I liked them so much. At a price of $5/dog, $1/human at Mesquite and only a flat rate of $5/dog at Rowlett, you simply can't beat it! Milt has an absolute ball every year, and Jeff and I get in on a lot of the fun as well. Below are the photos from both days; Saturday we attended Mesquite's event, and Sunday was Rowlett's. 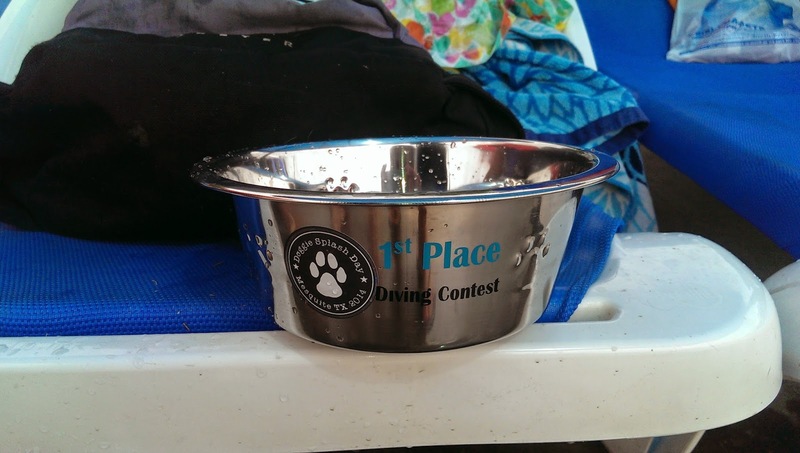 Let's begin with a win -- Milton won first place in the doggie diving contest in Mesquite -- my heart was just busting with pride! It's kind of sad, but I tend to live vicariously through my very athletic goldendoodle. As I have never won anything in a sporting competition and because I was cut from two sports teams, I kind of felt like it was me sitting up there with Milton. I mean Grand Nan and I did practice that ball throwing with him all summer long. It wasn't just a trip up North to visit Grand Nan; it was really a secret training trip too...! Initially, it took a lot of prompting for Milt to jump off the high diving block. He got after it though! As soon as we saw Milt's score, we knew he had it in the bag! Milt was wondering why it wasn't gold...! Last year they had trophies, and I was a bit disappointed because I would have given a trophy a very prominent place in our house. 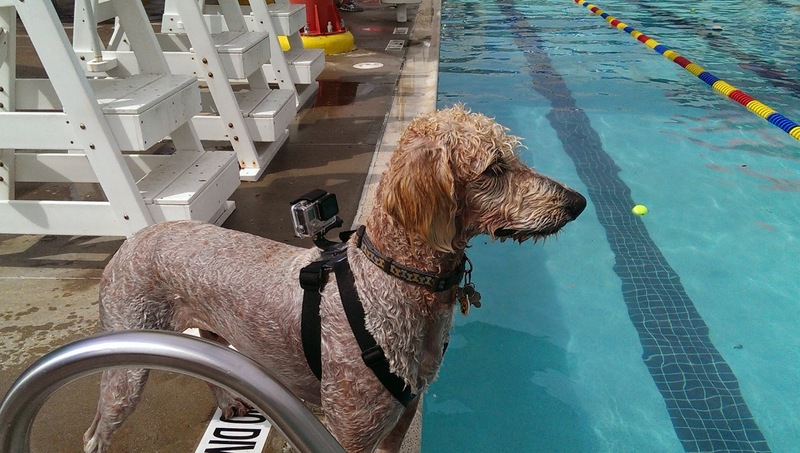 After the diving contest, one of the event planners asked if she could strap a GoPro camera on to Milt to record his jumping. That, to me, was just super cool. 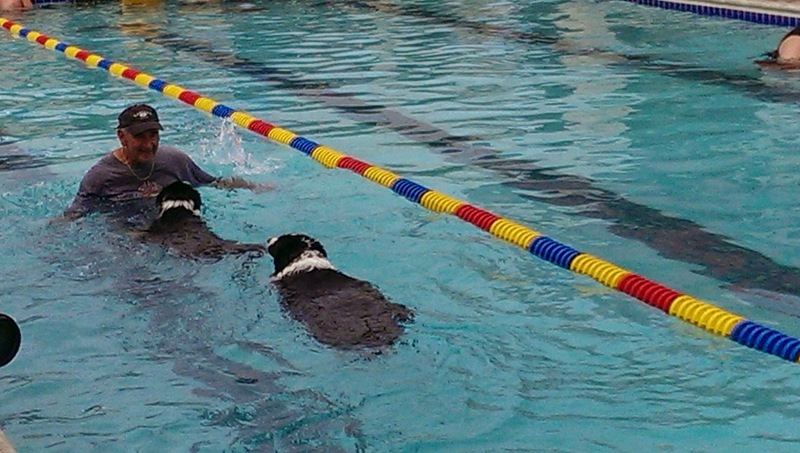 We decided not to participate in the doggie paddle contest because we wanted to let somebody else have a chance to win... ha! 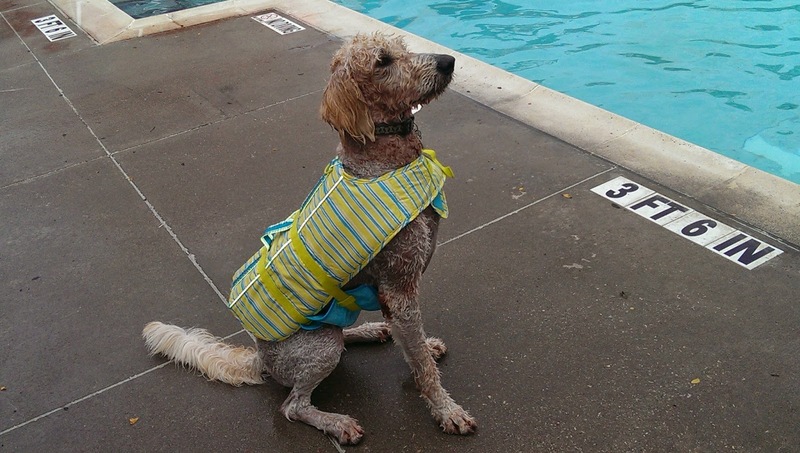 Our goldendoodle is actually not the most graceful swimmer, so I doubt he would have won that one. 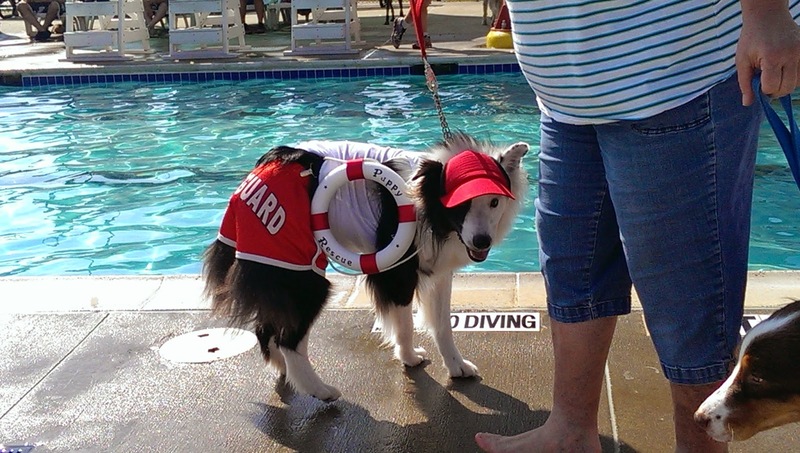 Another contest that we didn't participate in was the swimsuit contest. Next year maybe we will plan ahead and come prepared with some sort of fashion ensemble. A lot of these events will feature dog vendors, and we picked up some good swag -- treats, a plush squeaky toy whale, and a couple of plastic tops to place over an open can, which I was actually quite excited about. Our best free item, yes, free, was a Martha Stewart brand life jacket! I was thrilled to grab it because all summer long I wanted to purchase Milt a jacket for boating and sailing purposes because despite being a fantastic swimmer, if our boat was ever to go down, I don't know if he would have the stamina to swim all the way in from the middle of the lake. Life jackets can be quite pricey, so this was really a good find! 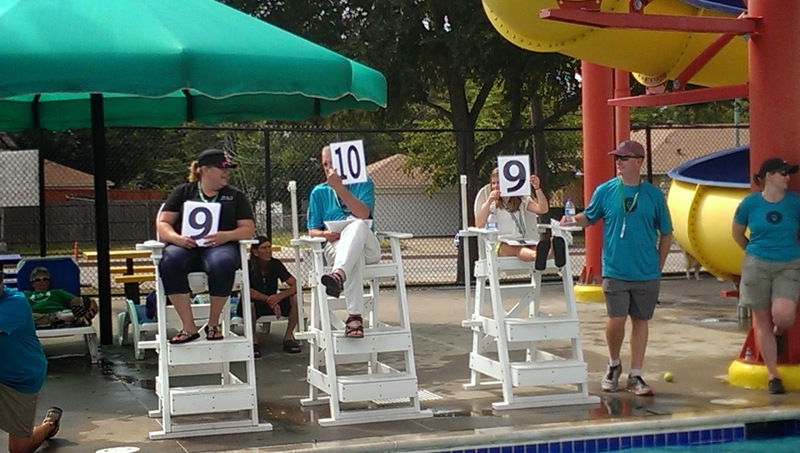 I think the diving champ was slightly embarrassed to wear a life jacket. 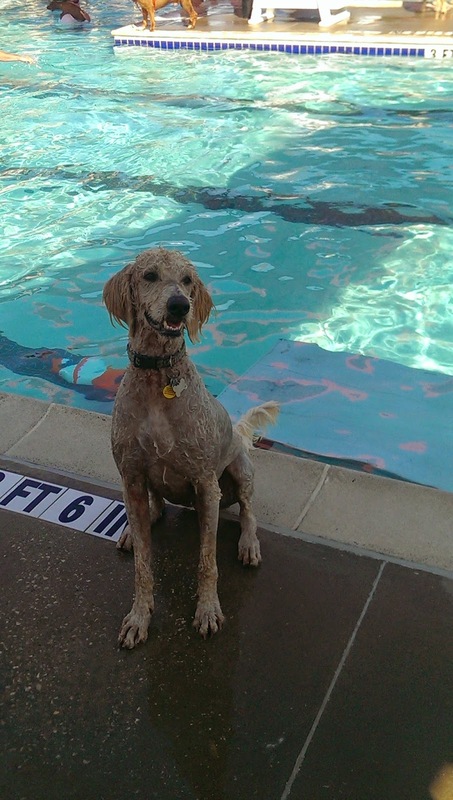 Of course, playing fetch is Milt's passion, but playing fetch in the water is even better! 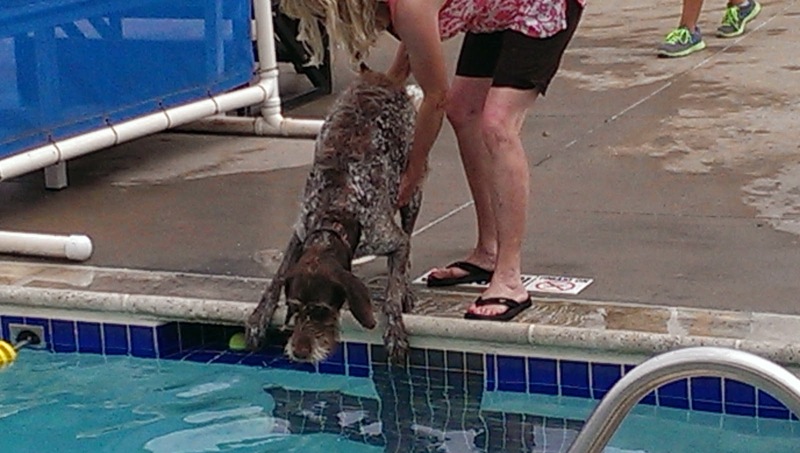 Like last year, there were tables in the water to aid the dogs in getting out. 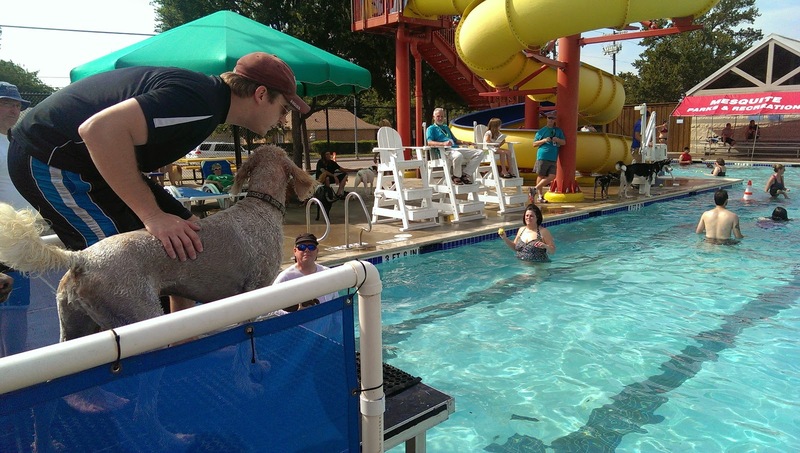 The best part about Doggie Splash Days is that you get to see all sorts of owners who are just incredibly excited to be out and about swimming with their family, the dogs. Here is the YouTube link to a video that Jessica, the marketing specialist, at the City of Mesquite put together: DoggieSplashDay14. Milt's GoPro bit is included in this. Jessica also informed us that Milt was featured in the Mesquite newspaper as well; I have yet to see the article. 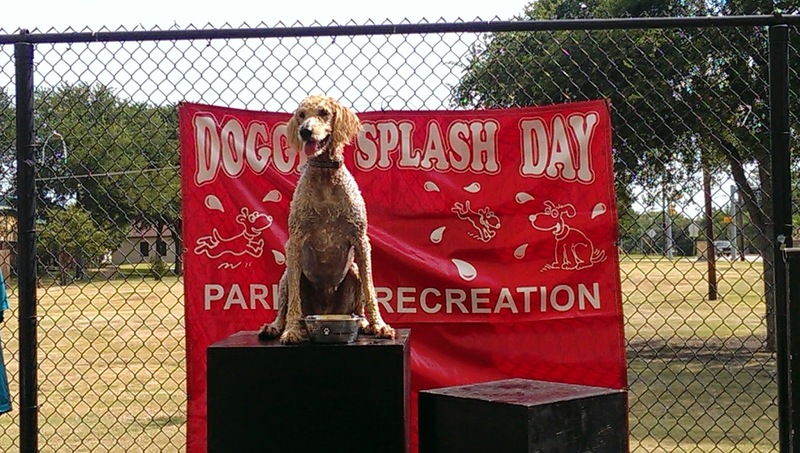 This Doggie Splash Day is an annual event, so definitely think about attending next August! 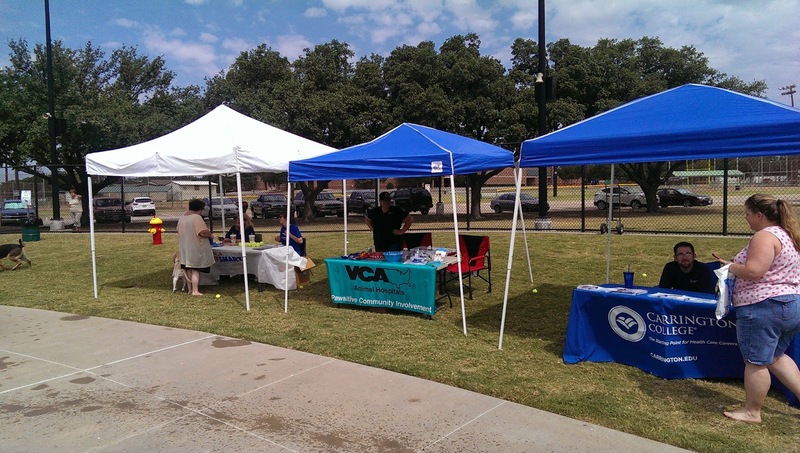 On Sunday, it was a downpour all morning long, but, thankfully, it finally brightened up in the afternoon, so we could attend Rowlett's Doggie Splash Day too! 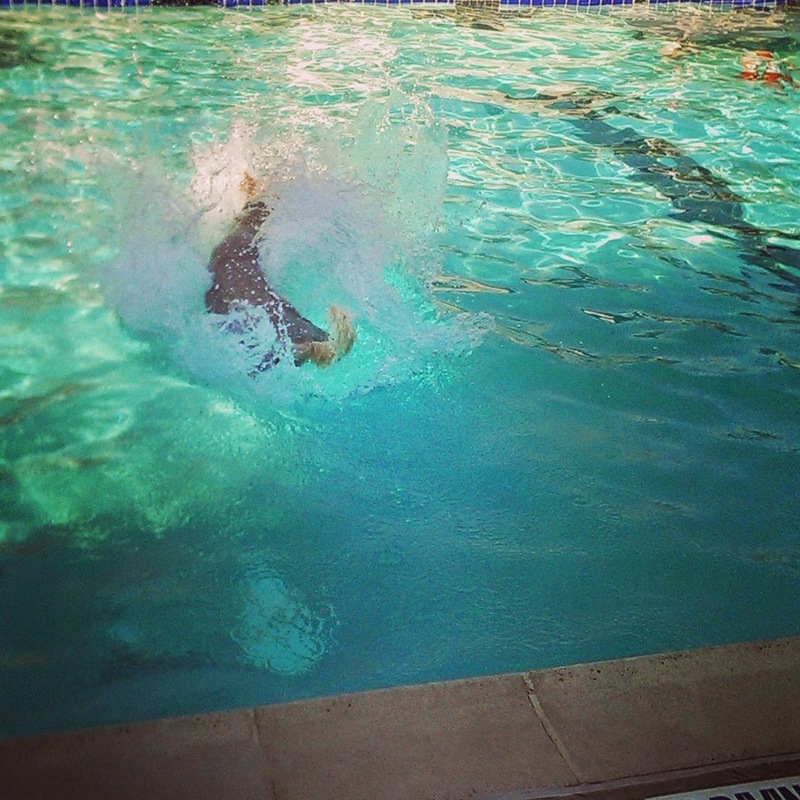 Two splash days back to back is a lot to handle, but we loved every minute of each. Those previous two pictures were the ones that a photographer snapped for Milt's Dallas News feature. Sometimes Milt gets a little impatient while waiting for the toss. Momma Dog even got in on the action at this one; she was getting tired of snapping all the shots! Milton, if you didn't know or hadn't guessed, is a big fat ball hog. Jeff and I need to play with him at these events because otherwise, if we slack off for even a minute, he is crashing somebody else's game of fetch. He's some doodle dog, that one. 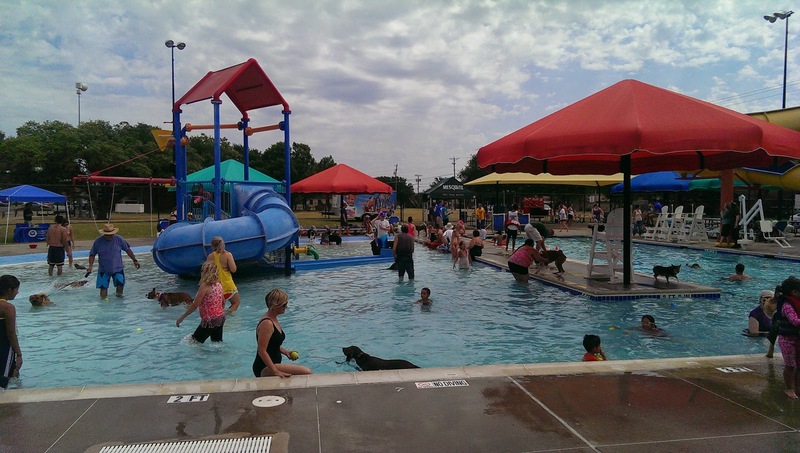 Rowlett's day is held at an actually splash park. Quite a lot of characters show up for these events. I finally was a little more bold in asking to take photos of other people's four-legged pals. It really was quite the weekend. 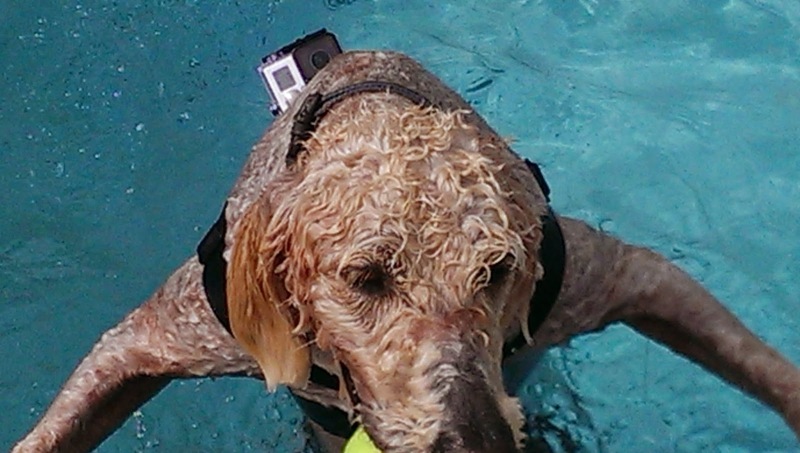 Here is a little video - Goldendoodle Splashing! - of Milton hopping about! Until next year... Mark your calendars now! Follow Milton on Instagram: milton_the_goldendoodle. These pics are great! What an awesome event for dogs and marketing for the vendors. Milt may not have a side car but he's a trophy winning athlete! That's so cool they strapped a gopro to him!! He probably thinks he went to doggy Disney World this summer! Thanks for reading, Jenny! I hadn't heard from you in a while, and I thought I might have lost my biggest fan, after my mom, Jeff, and his mom, of course...! Ha! Jeff, by the way, had a wonderful night at your house. Thanks for always being such a gracious hostess!